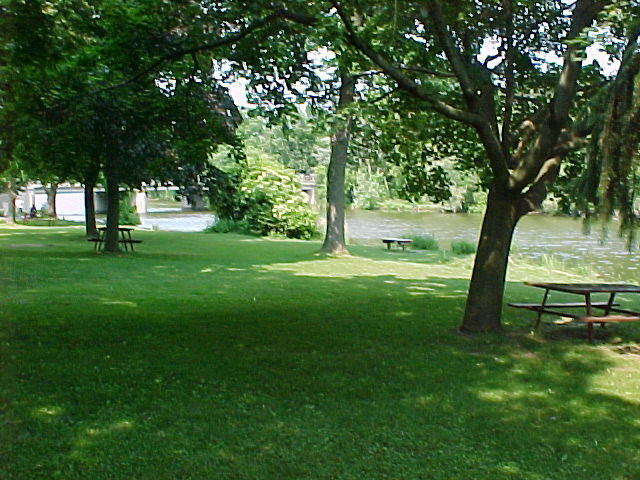 Now known as Pioneer Park, the riverbank along which Richard Ela’s factory once stood in Rochester, Wisconsin, is still a beautiful picnic spot. Along the river between the bridge and the factory, many families were spreading quilts on the grass. Katie and Amos spread theirs in the shade of a maple where they had a good view of the side door of Mr. Ela’s factory. The speakers would stand on the stone steps of the factory. Nearby, the American flag flapped in the breeze. Ma and Matilda unpacked the fried chicken, black raspberry tarts, thick slices of bread and butter, and peas in the pod. . . The schoolmaster’s clear voice rang out over the crowd. We hold these truths to be self-evident, that all men are created equal, that they are endowed by their Creator with certain unalienable rights . . . The familiar words echoed across the hot July air. A shiver went down Katie’s back as she realized that across this vast country, from New York all the way west to California, Americans would pause from their daily work to hear these words and mark this day.